CARDIFF, MAY 25th 2017 – GOODGYM – the community of runners who combine getting fit with doing good – launched in Cardiff this week (May 23). The inaugural run on 23rd May saw 35 runners run 2K to Canton Community Hall where they helped Canton Grows Wild create a disabled access path to the gardens, plant 100 plants, pull up weeds and install a brand new sign. The task involved the runners shifting 1 tonne of rocks and gravel using buckets and wheelbarrows for an intensive workout before running 2K back. Members of the new GoodGym group in Cardiff, which has a unique approach to building community cohesion, promoting fitness and reducing social isolation, will stop off on their runs to do physical tasks for community organisations and to support isolated older people with weekly social visits and one-off tasks they can’t do on their own. The group will meet every Tuesday at 6.15pm, in the foyer of the Yr Hen Lyfrgell (The Old Library) in town, before heading off for a run and to complete a task for the evening. In addition to the weekly group run, some GoodGym runners will also be paired with an isolated older person and commit to a weekly social visit and/or help with one-off household tasks. The GoodGym befriending scheme has been proven to reduce loneliness and improve wellbeing. Over 320 people have already signed up to the Cardiff group, with 21 founding members. GoodGym Cardiff and the Vale of Glamorgan is supported by the Cardiff and Vale of Glamorgan Integrated Health and Social Care Partnership and has received support from the Welsh Government’s Integrated Care Fund. Age Connects Cardiff & The Vale, the council and Age Cymru act as referrers for linking older people to GoodGym for coach runs and missions. Maria Battle, Chair of Cardiff & Vale University Health Board, said: “On behalf of the Partnership we are delighted that GoodGym is launching in Cardiff. We are fully committed to promoting active lifestyles as part of our strategy for keeping people well. What is fantastic about this initiative is that this is combined with supporting older people in our communities and helping ensure that people can build friendships and retain their independence living at home. GoodGym runners have carried out over 50,000 good deeds to help older people and community organisations throughout the UK. GoodGym operates in 31 areas nationwide and aims to launch in every city in the UK by 2018. 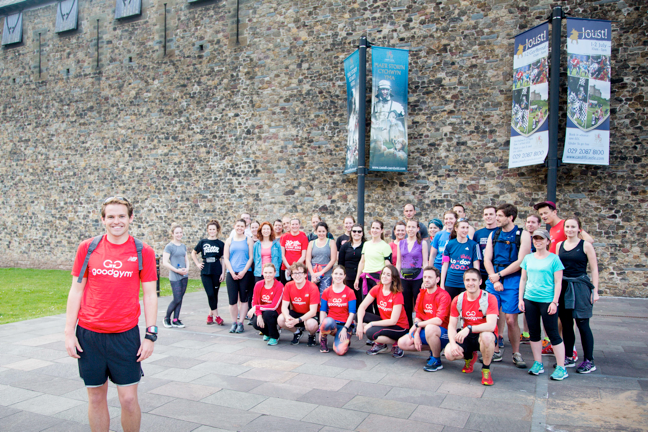 GoodGym Cardiff group runs take place every Tuesday 18:15 from The Old Library. The runs are free to attend and more information can be found at www.goodgym.org.